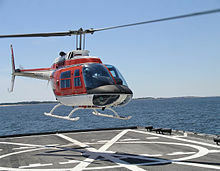 ^ "Bell 206A JetRanger for Sale". Retrieved 13 November 2014. ^ Host, Pat (April 2015). "Army's aviation restructuring not to affect civil helicopter market". Rotor & Wing. Retrieved 12 April 2015. ^ PanAm Post Staff. "Helicopter Crash Kills Guatemala's Army Chief of Staff". PanAm Post. Retrieved 13 November 2014. ^ "Ricardo Boechat, jornalista, morre aos 66 anos em queda de helicóptero em SP". G1 (in Portuguese). Retrieved 2019-02-11. ^ a b "HKP6". www.avrosys.nu. Retrieved 2018-03-18. ^ a b c d e f g h i j k l m n o p q r s t u v w x y z aa ab ac ad ae af ag ah ai World Air Forces 2014 "WAF 2014" Check |url= value (help) (PDF). Flightglobal Insight. 2014. Retrieved 12 December 2014. 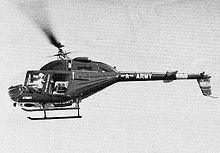 ^ "Army Bell 206B Jetranger III AE-366". © 2006-2013 Airplane-Pictures.net. Retrieved 26 January 2013. ^ Rivas, Santiago (25 January 2018). "Argentina receives first five AB 206 helicopters". IHS Jane's 360. Buenos Aires. Archived from the original on 26 January 2018. Retrieved 26 January 2018. ^ "World Air Forces 2011-12" (PDF). flightglobal.com. Retrieved 17 January 2014. ^ "Bangladesh Army Aviation Accepts Two Dauphin Helicopters". malaysiaflyingherald.wordpress.com. Retrieved 17 January 2014. 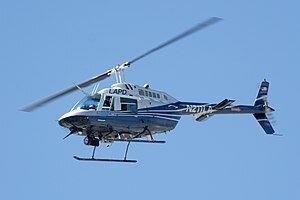 ^ "BELL 206 - Aviación Policial de la Policía Nacional". National Police of Colombia. Retrieved 13 April 2017. ^ a b Petrova, Alla (27 November 2012). "The government today ordered the Finance Ministry to allocate the State Border Guard LVL 0.84 million from the budget's emergency funds for the procurement of two helicopters". The Baltic Course. Retrieved 26 January 2013. ^ "Iraqi air force opens pilot training school". flightglobal.com. Retrieved 4 December 2014. ^ "Elbit extends military pilot training deals with Israel". flightglobal.com. Retrieved 12 December 2014. ^ J-HangarSpace. "Japan Coast Guard: Aircraft Data File". Retrieved 27 June 2016. ^ "Helicopters from Finland accepted into service in Latvia". baltic-course.com. Retrieved 17 January 2014. ^ "Serbian Interior Ministry Air Wing". aeroflight.co.uk. Retrieved 29 January 2013. ^ "Bell Textron Canada TH-67A Creek". taiwanairpower.org. Retrieved 26 January 2013. ^ "LAPD Equipment". lapdonline.org. Retrieved 1 September 2014. ^ "Aircraft Histories RAN". Navy.gov.au. Retrieved 29 January 2013. ^ "Bell CH-139 JET RANGER". canadianwings.com. Retrieved 17 January 2014. ^ "A 40 años del Comando de Aviación de Ejército". Retrieved 13 November 2014. ^ "JDF "Rotary wing" previous fleet". jdfmil.org. Retrieved 26 January 2013. ^ a b "HKP 6 - Agusta Bell 206A JetRanger (1968-2004)". Retrieved 27 January 2013.